Buy Goro Le Goro directly from us on CD or as a pretty gift card with a download code. 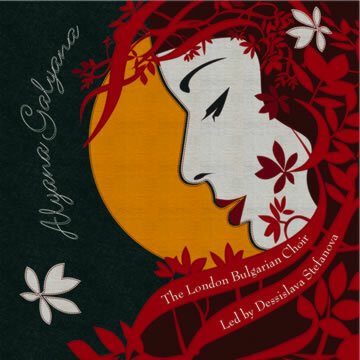 Buy Alyana Galyana directly from us on CD or as a pretty gift card with a download code. 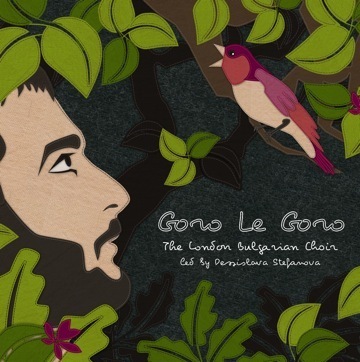 Goro Le Goro takes us to the cool, green forests of Bulgaria where heroes roam, nightingales sing and cherry trees bear fruit. Distant voices singing “on high” cut through the mist and the sunshine reveals beautiful maidens. But the forest is also a place for men so there are songs of rampant flirting and seduction, of fighting for freedom from the Ottoman Turks... and of knitting, manfully. * Newly-comissioned songs from Kiril Todorov. Mixed folk choirs are unusual in Bulgaria, and the Bulgarian choral repertoire is almost exclusively female. This album's masculine tone, in contrast with our more feminine debut Alyana Galyana, emerged as we worked with Bulgarian composer Kiril Todorov. Of the sixteen songs on Goro Le Goro, Kiril wrote half - seven of them new commissions. We feel extraordinarily lucky to be working with Kiril, whose new songs are not only masterpieces in the Bulgarian choral style, but have been written to take advantage of our own unusual balance of voices. We have been flattered and stunned in equal measure by the muscular new arrangements Kiril has written for the choir, and relish performing the songs. We hope you enjoy the result. Copies are £10 + £1.50 P+P. The CD comes with Jay Alvarez's gorgeous full-colour booklet which includes translations of the songs, and we'll put it in the post tomorrow. The button above will allow you to pay with your credit card, or through PayPal. Reassuringly, PayPal deals with the security and privacy for all these transactions. There's a special price if you're buying more than one. Email us to set it up. If you're desperate to hear it all right now, you can download the album from Bandcamp. It'll cost a little more, you'll download the songs immediately, and we'll still send you the CD tomorrow. Alyana Galyana is the choir's first CD, and contains 18 of our favourite songs. You can hear short excerpts of some of the tracks by clicking on the links below. We've tried to make this the very best recording we could; we gathered in wonderful spaces and found expert engineers (Dill Katz recording, Nick Robbins mastering) to capture the choir's particular sound. The CD comes with a beautiful eight-page booklet containing translations of the songs. The CD is only available from us, either at concerts, or through this website. Every penny spent on the CD supports the choir and the composers of the music. Copies are £10 + £1.50 P+P - the button below will allow you to pay with your credit card, or through PayPal. Reassuringly, PayPal deals with the security and privacy for all these transactions. If you like the beautiful design for the cover, you might want to know that we have t-shirts based on the same design in all sizes, short and long sleves, for a tenner. Email dessi(at)londonbulgarianchoir.co.uk if you would like to know more. The cover was designed by Jay Alvarez, who also sings on the album.